As Christmas approaches, it’s time to give a thought for Turkeys. Not many people realise that in addition to the wild turkey ancestor of the Christmas dinner, there is another, much rarer species – the Ocellated Turkey. Its name derives from the peacock-like ocelli (eyes) on the tail feathers, and it is a rather beautiful bird. Being turkey sized, and tasty, it is popular with hunters, and increasingly rare over much of its range. It is only found in Central America, in Guatemala, Belize and Mexico. One place where it is very common, and now very tame is around the visitor centre of the Rio Bravo Conservation and Management Area (RBCMA), owned by the Programme for Belize (PFB). PFB was set up with funding from many organisations, including the UK-based World Land Trust (WLT), and now manages nearly 300,000 acres of forests and other habitats. Ocellated Turkeys are increasing, despite being prey for jaguars, which are also widespread in the RBCMA. The WLT works through local organisations to conserve important areas for wildlife, and is currently raising funds to acquire land in Ecuador and in Argentina. 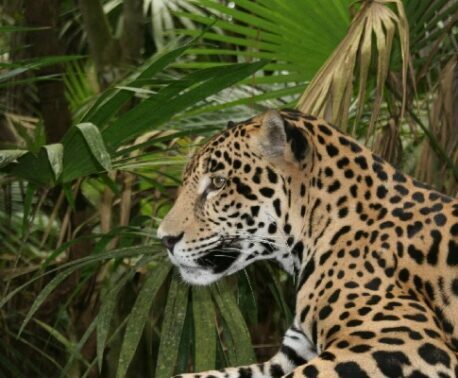 These lands will help save a wide range of species, many of which are endangered and includes Jaguar, Puma, Geoffroy’s cat, Spectacled bear, Guanaco, whales, condors, parrots and humming birds. For more information visit the Projects pages of the WLT website.